The Centre de conservation du Québec is a provincial institution attached to the Quebec Ministry of Culture and Communications. Its mission is to contribute to the conservation and restoration of Quebec's cultural heritage, including artefacts, art works, furniture, public art, etc. The centre helps to increase the visibility and the accessibility of such heritage to the greater public. encourage the development of knowledge, skills and facilities relating to an optimum preservation of the Province's cultural heritage. This section contains a few of the documents, publications and information currently available in English. New links will be added, as the English-language section is still a « work in progress ». Preserv'Art is an interactive database of products and equipment used for the conservation and protection of artifacts, works of art and archival documents. It was developed for collection managers, archivists, curators, conservators, artists, museum technicians, students, teachers, and ... for you. Please note, not all publications have been translated into English. For see the others publications go to the Publications section in the french version site. 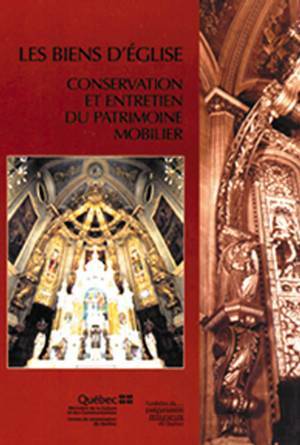 Centre de conservation du Québec and Fondation du Patrimoine religieux du Québec, 2001, 112 p.
On sale at Centre de conservation du Québec. France Rémillard, ministère de la Culture, des Communications et de la Condition féminine, 2007, 27 p.
KI-Starch Microtest. Archival bulletin. Vol.3, no.2. Francine Gauthier, ministère de la Culture, des Communications et de la Condition féminine, 2005, 2 p.